I installed a PILE of new drivers tonight from Lenovo using their most awesome System Update 4.0. Included was a Bluetooth Stack update. On a whim, I tried to pair my Jawbone Bluetooth Headset, something that has never worked before, and it worked! More interestingly, when I right click on the Jawbone and click "Control" I get this dialog I've never seen before! This actually looks and feels a tiny bit unpolished. Note the tight vertical whitespace at the VERY top and the strange blue gradient, as well as the Vista-esque color scheme on the far left. Not sure if this was in Vista and just not updated for Windows 7, but it looks weird. UPDATE: Confirmed - This crazy wrong looking dialog is owned by Lenovo, not Windows. 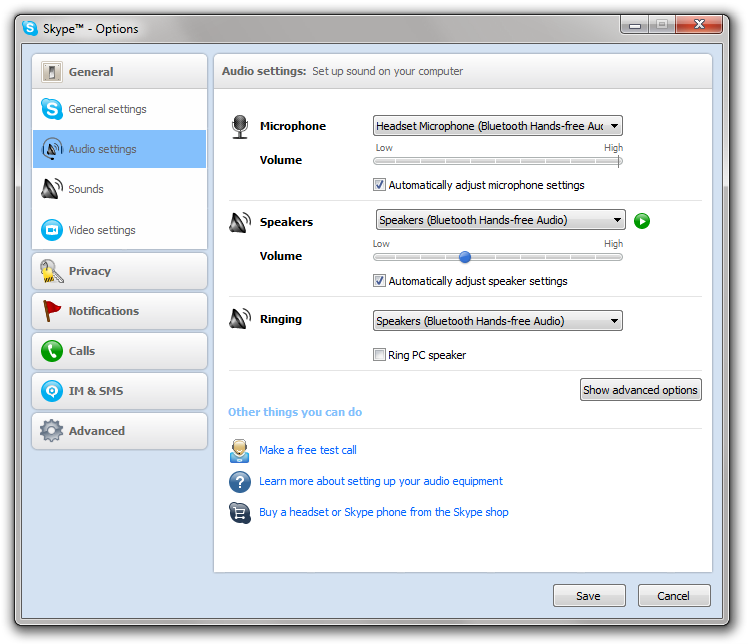 Still, then Skype popped up suddenly and said there was new audio devices available! Sure enough, I've got a new Microphone and new "Speakers" in the form of my Jawbone headset. I can even use this headset for Voice Recognition, or even as my Default Communications device for Phone Calls with Office Communicator. Or, I can listen to music through my Jawbone. Deeply cool. 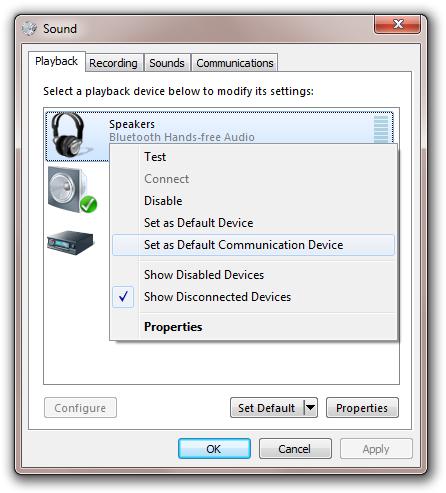 I'm not sure who to thank, Windows 7 for better audio and Bluetooth support, or Lenovo for a Bluetooth 2.1 driver. Either way, I'm thrilled that my laptop can suddenly do something with Windows 7 that it couldn't do yesterday! Very cool. Both the bluetooth headset - and System Update 4.0, which I'm now installing. The "Bluetooth Headset Operations and Settings" dialog is very likely part of a third-party driver package made to look like a Vista control panel. 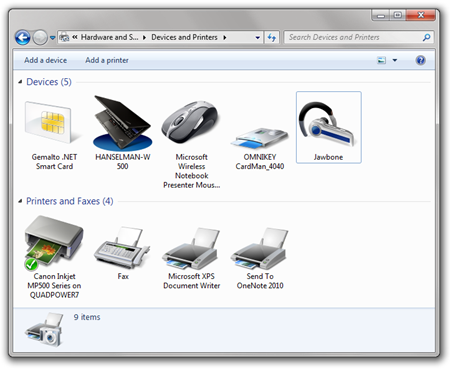 The anachronistic color scheme, the description in the left panel, and the nonstandard Chevron widget all suggest that it isn't a Microsoft control panel applet. Not that Microsoft gets the UI right all the time .. just type "Fax and Scan" in Windows 7 and view the beautiful XP-era dark blue toolbar (assuming you have a Win7 edition with Fax&Scan). Is this bluetooth dongle can be used to use Computers Mic as Mobiles voice input and computers speaker as mobiles speaker. if this way i can use the pc to do the hands free. This is for a Car PC i am doing. 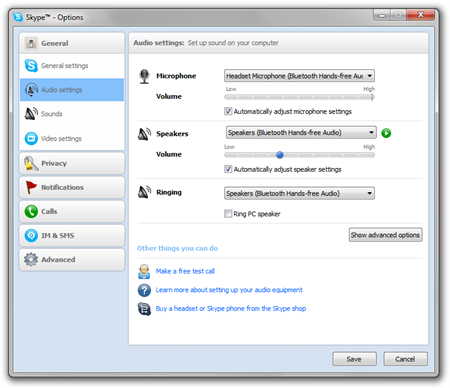 I was searching for this in the internet, some where i red that it is available in Windows 7. I have the same funny dialog on my new HP Pavilion DM3 (also running Win7) so it can't just be a Lenovo thing. Maybe HP and Lenovo use a common BT stack? So I've installed System Update 4.0, and I don't have any bluetooth driver update (I have a z61p). Now I'm thinking whether or not to go get a bluetooth headset - in your opinion, would I be able to connect it to my computer? Some manufacturers in the rush to get to win 7 adopted other BT stacks. For example Dell is including now the Toshiba stack ... much better than their previous plan drivers. Now it works better with my Nokia phone and other BT laptops. With that, I can say that my BT experience under Win 7 (x64 edition!) is better than my previous XP and Vista experiences. Thanks for the tip! 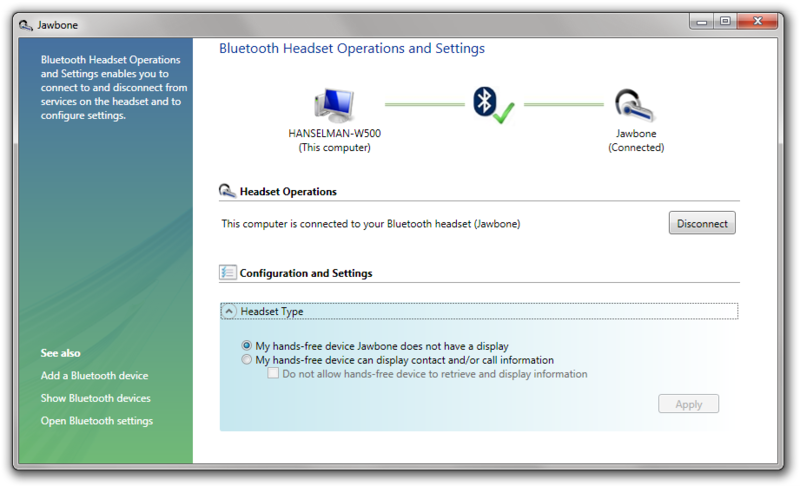 I have found my Nokia bluetooth headset working without any third party software on win7. Had to use a tool called bluesoil or something like that on XP. Be careful though if you are using voice recognition with Bluetooth headsets. My experience has been that the limited audio bandwidth on the mic channel gives Windows speech recognition a hard time and reduces the accuracy, which can be frustrating.